Effective law firm management is critical to building a profitable and high performing law firm. Many law firm owners enjoy practicing law but struggle with the daily details of managing the firm. It can be hard to build a team you fully trust then let go and allow the team to implement your vision. Our team has more than 100 years of combined law firm management experience – we’ve seen and done it all! Catalyst builds high performance law firms through committed partnerships with law firm owners. Develop work environments that position the firm for success. Today’s law firm members need a positive work culture with clearly defined expectations driven by leadership, a common vision and shared values. Retention and performance both depend on a positive, functional work environment. Identify and help implement best business practices. These practices include researching smart tools or partners (information technologies, human resources, marketing), functional processes that make the work easier and more efficient, and putting into practice the important concept of work/life balance for the entire firm (senior leadership included!). Law Firm Coach also offers ethical leadership and training workshops. Set up a supportive management structure. 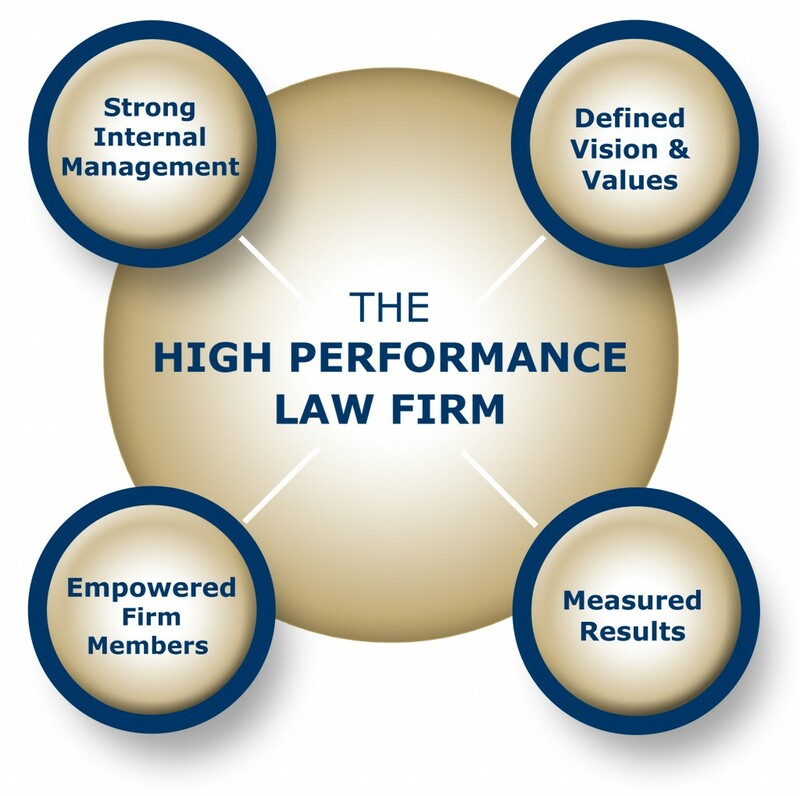 A high performance law firm is built upon the values of its owner and has a strategic plan to provide continuous forward growth. It has the principles of high performance and exacting standards in every element of its structure. It has a strong internal management system that provides for measurable results. Train management and key personnel to mentor others. Everyone needs a mentor, regardless of their position in the firm. It is critical for the management team to understand how to grow and support internal talent without feeling threatened. In a high performing law firm, each firm member understands his or her role in achieving the mission. Each team member should be a proactive problem solver and take full responsibility for making decisions, resolving issues, and continuously improving the quality of their work within their defined roles. Build strategies focused on profitability. We cannot forget a law firm is a business and needs financial controls, budgets, and reporting. An effective law firm operates with a foundation of values and delivers a profit and a positive return on investment for its owners. Law Firm Coach can also assist with evaluating mergers and acquisitions as a way to grow the firm and increase profitability. Discuss and formalize partnership planning, succession planning, and exit strategies. Many law firm owners put off the discussion of the firm’s future (or their own) for various reasons. Adding a partner or grooming a successor requires a good deal of planning and deliberation, and partnership documents must be re-evaluated on a regular basis to ensure the structure remains equitable for all parties. Having an independent third-party assist can ensure decisions are made on facts and not emotion. Catalyst can also be your outsourcing resource. Need help with marketing, hiring, information technology, or another operational area? Just ask us. We probably have someone we recommend and can connect you with to get the job done. Learn more about outsourcing.